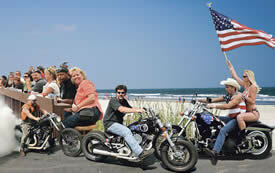 The Myrtle Beach Resort is a perfect lodging choice for bikers coming to Myrtle Beach anytime of year. Why? Because we are bikers! If you're coming for a Bike Week, want to be close to the Grand Strand Rally events and want to avoid the city limits of Myrtle Beach, we offer the perfect location. We're conveniently located less than 1 mile south of the Harley dealership outside the city limits, and just a few minutes north of all the bike week activities in Murrells Inlet - The Seafood Capital of South Carolina. parking for motorcycles, and 24-hr security. Click here to take a look at all the condos we have available for Bike Week. Even if you're not coming to Myrtle Beach for one of the Myrtle Beach Bike Week Rallies, the oceanfront Myrtle Beach Resort is still the best location for your motorcycle. 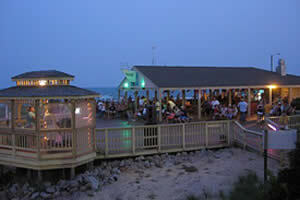 Live entertainment Friday, Saturday & Sunday night at our ocean front cabana bar. 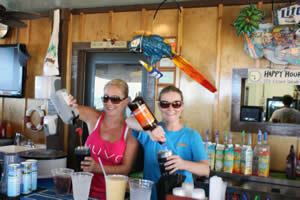 At Myrtle Beach Resort Vacations, we recognize and value our Biker business. We have 100's of bikers staying with us for each Myrtle Beach Bike Week including the Harley-Davidson Spring Bike Week, Black Bike Week (Atlantic Beach Bikefest) and Fall Bike Week. The Myrtle Beach Bike Weeks, a.k.a. Grand Strand Bike Rallies or Myrtle Beach Area Rallies, are already becoming bigger and better with events and activities planned all along the Grand Strand (south, north & west of the city limits). The Grand Strand area is approximately 60 miles of beaches from Little River to Georgetown and is planning on welcoming you. The South Carolina Supreme Court has overturned the City of Myrtle Beach's motorcycle helmet ordinance. Helmets are optional for riders 21 & over - in Myrtle Beach and the Great State of South Carolina. With the Spring Rallies scheduled for May, Myrtle Beach Resort is gearing up for a great week by scheduling biker friendly events & entertainment of its own. We are looking forward to live bands performing onsite throughout each of the Spring Rallies at The Quarterdeck, our oceanfront beach bar & grill. Please check back periodically for an update of scheduled events and biker specials at the Myrtle Beach Resort for Bike Week. Be sure to get your limited edition Bike Week t-shirt, made exclusively for the Quarterdeck and Myrtle Beach Resort, while supplies last. In celebration of 71 years of tradition in both the Spring and the Fall of every year, motorcycle enthusiasts gather in the Grand Strand area to share their love for the exhilaration of riding. This event started in May 1940 when a group of Harley-Davidson dealers created The Piedmont Harley-Davidson Dealers Association (later became The Carolina Harley-Davidson Dealers Association when South Carolina dealers joined) held an annual ride to Ocean Drive in Myrtle Beach. This event has since grown to a week long event with festivities throughout the entire Grand Strand region and now includes all brands of motorcycle enthusiasts. If you love bikes and the people who ride them, you cannot miss this event. The Black Bike Week rally, originally called the Atlantic Beach Memorial Day BikeFest, was founded in Atlantic Beach by the Flaming Knight Riders (later renamed the Carolina Knight Riders) motorcycle club in 1980. Every Memorial Day Weekend for over 20 years, thousands of bikers travel to the Grand Strand. Events include motorcycle racing, concerts, parties, and street festivals. Attendance has been variously reported as 350,000, 375,000, and as high as 400,000. It is considered the third or fourth largest motorcycle rally in the United States. Although the majority of attendees to the Black Bike Week (officially called Atlantic Beach Bike Week) are African Americans, this is an event for any race, any type of bike, and for everyone whether you ride or not. "The Pilgrimage", the smallest of the 3 motorcycle rallies on the Grand Strand was established in 1999. 2011 will be its 12th consecutive year. At 5 days instead of 7-10, this event is shorter than the Spring Rally but allows the bikers to enjoy the fabulous, Summer-like weather while missing the Summer crowds. Lower lodging rates, beautiful weather, great riding, less traffic & congestion all bring the bikers back to the beach each Fall. Sign-up below to receive Special Deals on our Myrtle Beach Condos as well as news about what's happening at The Myrtle Beach Resort and all along the Grand Strand. These Fantastic Deals are only available to recipients of our Vacation Deals Newsletter.